Debugger plays an important role in any development platform. As much stronger the debugger is, as less consumption of debugging time. SQL Server 2012 came with the strong debugging techniques that will reduce your time and efforts as well. But how ? Before proceeding with the explanation of debugger, let me create an example to demonstrate debugger features. Before proceeding with the features, let me tell you how to run the debugger. 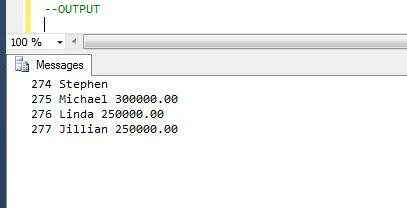 Go to Debug menu and select Start Debugging or Press (Alt +F5) as shown in the picture. Let me explain the feature of debugger in detail. This is one of the nicest features in debugger that will stop you putting unnecessary breakpoints on INVALID location. 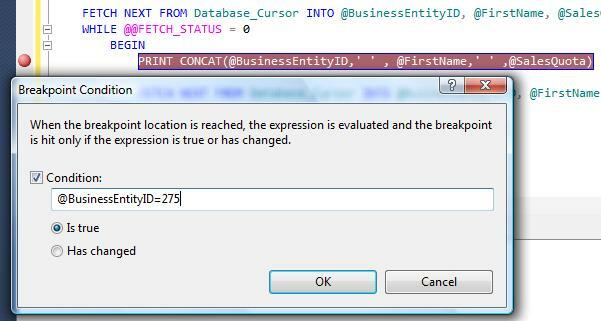 In the earlier version of SQL Server, we could place the breakpoint but we could not put any condition inside the breakpoint. 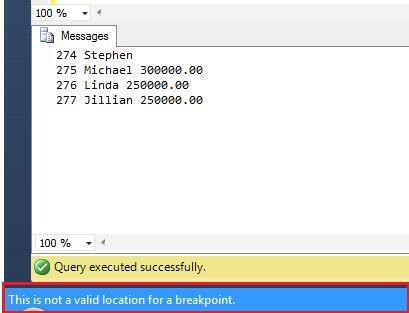 In SQL Server 2012, you can easily put the condition inside the breakpoint, so even if there is a breakpoint and if it does not meet the criteria, it will not stop the debugger. 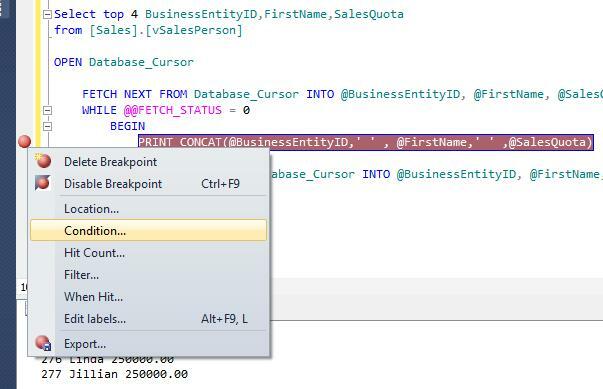 Let me show you step by step, how to put the breakpoint condition. 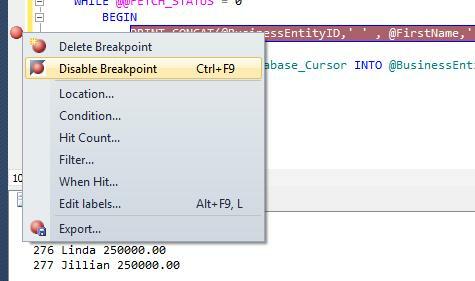 First of all, place your cursor, where you need to place the breakpoint in the query editor window and PRESS F9. 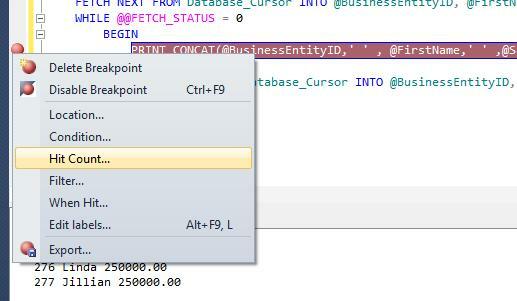 Right click on the breakpoint and select Condition as shown in the picture below. Once you get in the condition window just define the condition and PRESS OK.
Now the debugger will not stop at each and every row. It will only stop once debugger meets the criteria (@BusinessEntityID=275). Sometime, we partially finish the debugging, so we usually delete the breakpoint from line of code we already debugged. In my recommendation, until unless you finish the debugging do not delete the breakpoint, just disable it. 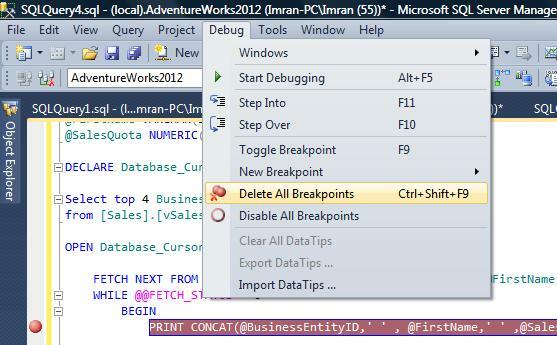 Both disable and delete breakpoint options are available on right click of the breakpoint, as shown in the picture below. 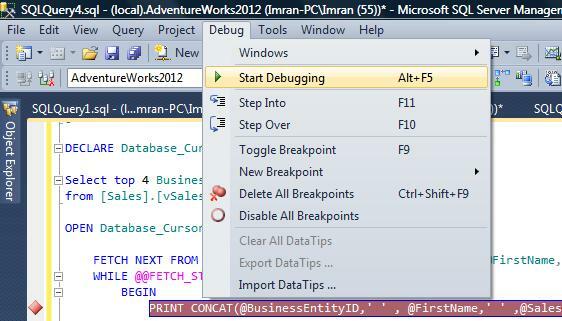 Note : You can also disable / delete all breakpoints altogether from DEBUG menu as shown in the picture below. Let me show you step by step, how to put the hit count condition. First of all, put a breakpoint. 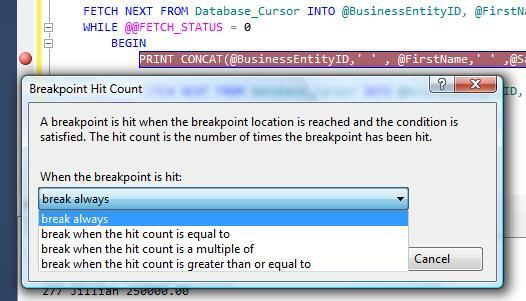 Right click on breakpoint and select Hit Count as shown in the picture below. Once you get inside the Hit Count window, by default it is break always but you can change it to any condition as shown in the picture below.